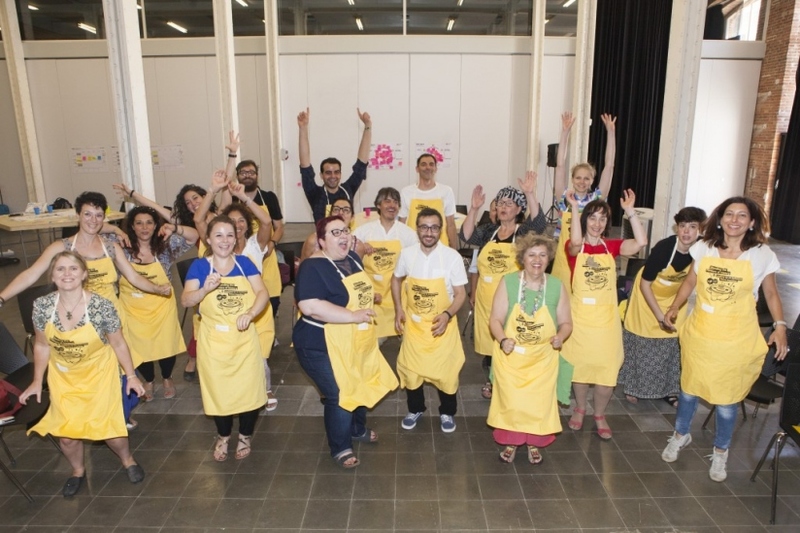 Last 3rd and 4th of July, in Barcelona, participants of the European project CultureLabs gathered in an intense and productive two day workshop at the huge ex-industrial-now-cultural “creation factory” Fabra i Coats. The two-day session helped CultureLabs to be shaped as an increasingly more coherent project, in which actors share a common language and know each other’s understandings and goals for this three years journey. Platoniq, with its in-house expertise in co-creation and agile design thinking, was responsible for providing a methodology, within which the different representatives of each consortium organisation could set up the foundation and procedures for the CultureLabs platform. The methodology deployed during the workshop has drawn inspiration from participatory Cultural Heritage resources, previously co-developed by the partners (Platoniq and SHU): firstly, the co-design methodology developed by meSch, in which some of the methods, templates, experiences and examples of co-design workshops were included in its pool of ingredients. Secondly, the Wotify co-creation methodology and related tools, which will be at the core of the Culture Labs platform design and content. With that framework, the sessions were structured around processes and practices that combine and adapt the working methods of user-centered design, agile development, and co-creation to the environments of social innovation through Cultural Heritage. The sessions were framed under the metaphor of cooking vocabulary: participants were building projects as if they were recipes, which made it much easier in terms of ingredients (anything needed for a collaborative project to turn out tasty and well prepared); addressing the needs of different target audiences. The dramaturgy of the event was completed by providing each participant with the apron “Blending the flavours of history & cooking up and inclusive future together”. The work started with three examples of social innovation and inclusion presented as recipes: Platoniq’s “Moving communities” methodology example, People’s History Museum’s “Community curating” and COOSS’s “Human library”; helping the group visualise and digest the different ways in which a project can be translated into a recipe and what different components it might need. In order to explore the collaborative design approach, it is crucial to gain a multilayered understanding of who the project planners “are cooking for/with” and who are the beneficiaries. Therefore, a story about Precious, a young Nigerian woman in Italy, was read out loud in order to enhance the power of empathy and stories. Narration is a very strong tool to engender new ways of thought and action, as well as mindsets and processes for system change. As Ella Saltmarshe remarks on her article ”Using story to change systems”, published in the Stanford Social Innovation Review last February; stories have the power of glue, enabling people to connect with each other and generate narratives that build communities; the power of light, helping illuminate the past, present, and future, thus lighting up the paths of change; and the power of reauthoring the stories in different webs, meaning our personal, cultural and mythic narratives, deconstructing what we thought was given and raising new approaches. Another good reason to use stories in our collaborative approach is, as said in the Story based strategy website, that they inform more than just messaging. A Point of Intervention is a place in a system – physical system or a system of ideas – where action can be taken to interfere with the story in order to change it. Our words and our actions combine to tell a story. After working on the identification of beneficiary communities further through the “Someone’s out there canvas”, which is aimed to focus the cookers (participants) towards the inclusion of the most numerous collaborators for CultureLabs; the group was ready for the next exercises and surprises to come. to whoever participants imagined would help CultureLabs, did not matter how far they are. This helped creating the atmosphere (dynamic, empathic, and creative) for the “What-if-I” scenario planning: an exercise which makes it easier to identify the different parts of a project with a simple question which defines the main key concepts of any scenario or project: “What if as (role/beneficiary) I could (specific action) with (tools/contents/recipes from CultureLabs platform) so (an outcome or benefit)?”. As shown in a survey post-workshop, many participants enjoyed this activity because it enables project planners and other initiators to divide clearly many aspects of the numerous ideas presented, structuring them for potential pilots or recipes. After brainstorming all together 11 scenarios in total, three were chose on a democratic voting method and used in the rest of the workshop for its development and collective improvement. To close the first day, Platoniq showcased the process that preceded the recipe-building methodology, a comparative research (benchmarking) on diverse methodological approaches looking for the recipes’ core phases, ingredientes and cooking principles, aiming at developing a common framework for Culture Labs. This framework of recipe-building was then used for the last dynamic of the day, which consisted on translating the 3 “Wotify winner scenarios” into recipes, with their own ingredients, phases, steps and scopes for the next day to work on. During the second and last day, the group focused on o the digital component of Culture Labs and the common language that will be used in the future, As a first exercise, participants engaged in a dynamic in which everybody would stress the points a collaborative digital platform should have, according to their personal criteria, focusing on the factors that encourage engagement and motivation of users in digital participation platforms, from a user or citizen’s point of view, and to the ideal criteria of a platform developer. Next, and keeping up exploring and understanding the beneficiaries communities, a roleplaying dynamic was performed as a conversation among the imagined initiator and beneficiary of the scenarios previously created and developed the day before. Their possible personalities, aspirations and interests were dissected, giving importance to the power of individuals and intersecting circumstances. Another story, this time about Ahmed, was read: developed in collaboration with COOSS, the narration made participants connect more closely with multidimensional understandings of users and beneficiary communities. Finally, the tree of agreements dynamic was explored as a closing dynamic by all the consortium partners. Thanks to this session, the concepts which had been used and developed along the two days took shape and were applied directly to the CultureLabs platform. A series of ethical principles and design justice criteria (in the metaphorical shape of the roots of this tree) were discussed in order to settle the next steps, mostly taking into account the communities the project will be design for, never forgetting with. A common language, the trunk of the tree, in this case, a glossary, was created collectively in order to handle concepts known by all which would help the leaves of the tree, the platform itself, to grow as this CultureLabs beautiful journey is understood: together.